Our putting instruction will provide you the skills and knowledge to master the putting green. Our Putting Matrix Will Enhance Putting Performance! Key to improvement is understanding the essential elements to increase the chances of holing out the putt. 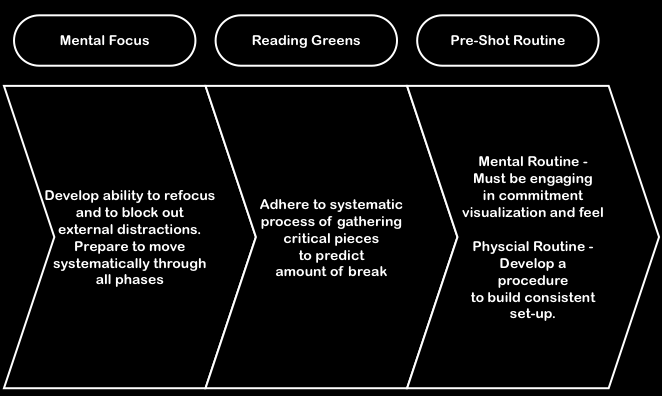 Our systematic approach to putting instruction looks at the key performance aspects within our proven putting matrix. Once issue is isolated, instruction and coaching to improve that skill set is provided. The most accurate and simple way to predict the amount of break on any green in the world, is by using AimPoint Express. Learning AimPoint Express from a certified instructor is key piece of properly utilizing the system. AimPoint Express is not only used by all our students, it is also used by hundreds of tour players around the world. We will teach you the key factors to improve the consistency of aiming at your aim-point. Accomplishing this task increases your skill set of starting the golf ball on your intended line. Ultimately, improving this putting skill set will start you on your path of making more putts and shooting lower golf scores. Corner stone of putting is being able to successfully control speed on uphill, downhill, crosshill and making adjustments to grain. Learning the keys to speed will dramatically improve your putting performance. Especailly when it comes to lagging those long putts close to hole. On-line storage of putting lesson and practice material included. Please specify in notes when booking. Dennis Sales Golf provides the best putting lessons in Dallas Fort Worth Texas. Come experience a world class golf course and training center to take your game to the next level. Dennis Sales Golf in known for being one of the best putting coaches in Dallas Fort Worth, Texas. Receive expert putting instruction at our state of the art training center in Flower Mound, Texas. Each putting lesson features SAM PuttLab, Blast Motion and AimPoint Express instruction.